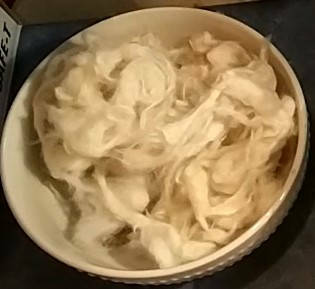 Occasionally I have short cuts of English Angora wool available that are particularly nice for soap making. You simply add a handful to your lye solution while it is hot to hydrolyze or dissolve it in the water solution. It is an interesting and unique additive for the artisan soap creators and a lovely addition to the soap. It has a similar effect as an additive as Tussah silk from the silkworm. I put a 'handful' of the fiber in an envelope and ship it out to you. Approx. one quarter oz of fiber for shipping in an envelope. This will make up to 10 five pound batches of Angora Fiber Soap. You also get a copy of a time tested soap recipe from my files with your fiber purchase.